I went into this game with low expectations. Saints form has been patchy to put it mildly. Then there has been the José Fonte saga, which has only just been concluded and goodness only knows what else was going on behind the scenes. On top of this, there was just the single goal advantage from the first leg and a hatful of missed chances, that surely the team would come to regret at Anfield. 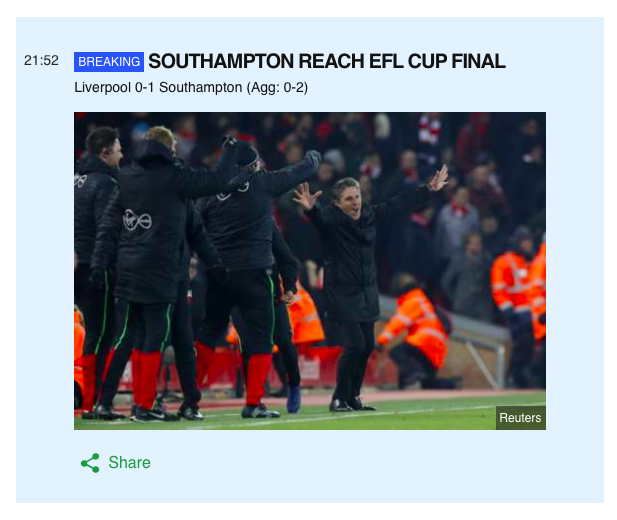 The crowning raspberry on the tub of negativity was Virgil van Dijk, our captain and resident superman, being petulantly stamped on by that oaf Vardy, during Saints 3-0 defeat of the Premier League Champions last Sunday. And all because VVD was making Vardy look more than a bit amateurish. Rumours swirled this way and that, about the seriousness of the injury, eventually culminating in the Saints Official Line-up, which revealed no van Dijk. The line-up was pretty much as expected, bearing in mind VVD's absence. Stephens lined up alongside Maya Yoshida at the heart of the defence. Davis returned from injury in place of Ward-Prowse and Rodriguez was preferred to Long up front. So the game started and for the rest of the game I was increasingly tense, to the point where I couldn't make any notes, or even type. In the first half, Saints gave as good as they got and in fact, both Tadić and Davis missed chances. Davis in particular should have at least tested the goalkeeper, but he blasted the ball, high, wide and not very handsome. At this early stage Redmond was having a great game and was causing the Liverpool defence all sorts of problems. In the heart of the defence, Stephens was by no means looking out of place. He is no VVD yet, but he was way exceeding my expectations. For all Liverpool's attacking reputation, they were not really threatening Forster's goal. A couple of tame shots were hit straight at him and hardly troubled him. In fact Forster only had to cope with three on target shots in the entire match. The third shot on target was a different matter. In the second half, when Liverpool were well in the ascendancy, Can hit a shot straight at Forster, with not a little power. The big Englishman made a bit of a dog's dinner of dealing with it initially and the ball screwed over him and was heading for the back of the net. Somehow he managed to throw himself to his right and knocked the ball away. The goal-line technology showed the ball had not crossed the line - just. But, I am getting ahead of myself. The match reached half-time goalless and Saints were doing a good job of protecting the one goal lead. Unseen by most (me included), Jay Rodriguez had taken a knock on the ankle and was replaced by Shane Long for the start of the second half. 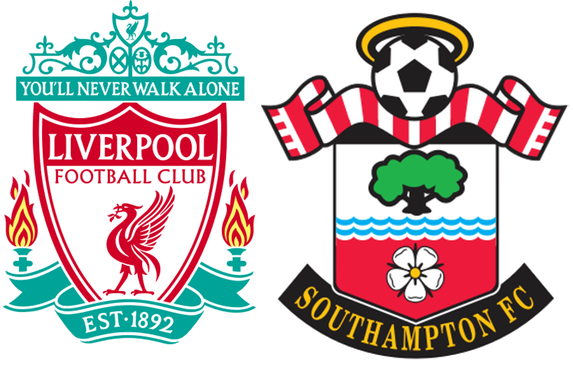 Liverpool really upped the tempo and Saints found it increasingly difficult to get out of their half. In fact for long periods the entire game seemed to be conducted around the edge of the Southampton penalty area. Some of Saints defending during this period was nothing short of heroic and I felt that all this effort would show up in some tired players towards the end of the match. Something interesting then started to become apparent, it was actually Liverpool that were tiring. Not only that, but the players were starting to argue amongst themselves. I remember one shot of Lallana having a right go at Chan. Just before the 60th minute Puel introduced a fresh pair of legs, bringing on Højbjerg for Ward-Prowse. Still the incessant pressure continued. By this stage I could hardly watch. Still Saints defended, bending, but not breaking. As the minutes ticked by it seemed that they were the fitter team, but with just a one goal lead, it would just need one slip, or mistake to let in Liverpool. Ten minutes from time Sims was brought on for Redmond, who had played a fine game. This substitution proved to be Puel's masterstroke, as Sims was key to what unfolded in time added on. Liverpool were practically camped around the Saints penalty area as we entered the four minutes of time added on. Then it happened (Have a look at the Match Highlights tab at the top of the page! ), Sims picked the ball up on the edge of the Saints penalty area and set off on a run straight at the Liverpool goal. He intelligently evaded the four red defenders and slotted an exquisite pass through to Long on the right. For a moment I thought that he had taken the ball too wide, but no. Calmly he stroked the ball past Karius. 0-1. Cue absolute mayhem in our house! The impossible had just happened, it was far too late for Liverpool to reply and indeed you could see their heads drop. A beaten side. The next few minutes were a blur and eventually the final whistle went. We are all going to Wembley!! I am just so proud of the team for this achievement and pleased for Claude Puel, who has taken a huge amount of criticism for the poor results of the last few weeks. We have a date with Manchester United at Wembley on February 26th. Whatever, Saints go in good heart and a real chance of victory. 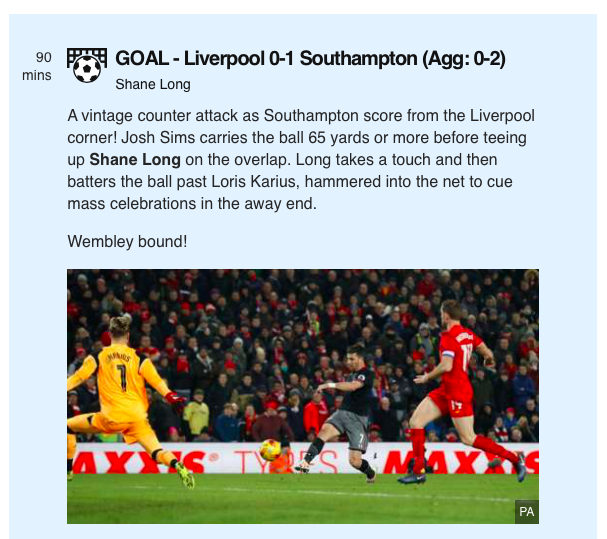 One statistic that had almost passed me by was that, while winning every game, Saints had not conceded a single goal on their path to Wembley. The first team to ever achieve that feat. Impressive, no? Sky gave it to Romeu, he was magnificent, the rock on which the majority of the Liverpool attacks foundered. There was Stephens, standing in for Virgil van Dijk, no small task. There was also Sims, whose intelligent run enabled Long to score. The list goes on and on, so I am going to break with tradition and award The Entire Team the MoM.